Itinerary Update : 7/31/13 - Musketeers Too! I thought I’d let everyone know where we actually are on the trail today. After last Tuesdays rain and wet tent at Kid Gore shelter, we’ve been off the trail searching for a better tent. First, the Long Trail has a wonderful shelter system and we love to stay in them. I have found that so many hikers bring dogs along. Carl is very allergic to dogs. Because of this I must carry a tent to guarantee that Carl has a pet free nights sleep. We are very glad we have the tent and so far have only been able to stay one night. Plus the bugs are really bad down south! Our new tent arrived from LL Beans on Monday. We now have a MSR Hubba Hubba. With this tents full vertical walls we will not get wet! The down side it has added 1 lb 8 oz to my pack. But good livable dry space will be worth it! 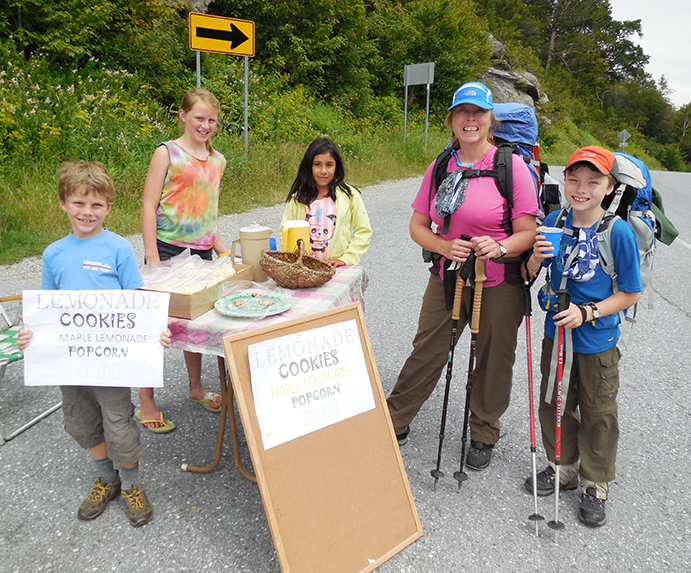 We had a nice treat of maple lemonade and chocolate cookies before we headed north at App Gap on July 26. Carl and I did not take the last seven days as complete zero days. On Friday July 26-27 we hiked from Route 17 (App Gap) to Mont Clair shelter. Friday night we spent the night at Birch Glen (his first night in a shelter!) and hiked Burnt Rock Mt to Mont Clair on Saturday. It was a day of blue skies, filling our stomaches with wild blueberries and hiking in the dark. I will share these adventurous two favorites days on the trail in a later post. One more slight set back, while hiking Saturday, Carl developed an ear infection with lots of drainage. After a doctors confirmation on Monday and medication (3 more oz. to my pack), we needed Tuesday to let the drainage stop. It has cleared up and this morning Carl and I are getting back on the LT at Stratton Mountain! We will be out for the next six days and five nights! We love the trail and are looking forward to our fun non-rushed hiking routine. I’m only able to update the Blog from home and have lots of videos and more of our hiking days to share. Carl has a doctors appointment next Tuesday and I will post more then.